Joey Fatone meets homegrown cooks. Joey Fatone heads to California to hang out with the Wainwright family for their annual Christmas lasagna party where they get together, make a ton of lasagna, drink wine and enjoy family. The result is pure Italian deliciousness and a lot of family fun! Joey is in Merced, California for a special meal that does his Italian heart proud. He's at the home of Pete and Queenie Wainwright for a peek into their annual Christmas tradition - a lasagna-making party. "Our lasagna party got started back when I was in high school," says Pete. "My mother would always make lasagna every Christmas eve. As they got older, my mom and dad could no longer make the lasagna, so I decided that since my family was growing up, that I wanted to bring everybody back together on Christmas eve and start the tradition over." Queenie welcomes Joey into their home and introduces him to her big family. Pete shares with Joey what's on the menu today - a pasta sauce that the kids call "papa sauce," a lasagna with homemade noodles, and Queenie's great great grandmother's recipe for molasses cookies. Pete's papa sauce starts with a base of vegetables and chicken stock, an unusual beginning to a pasta sauce. The veggies are simmered in the chicken stock while the tomato sauce cooks, and then blended and added to the sauce, along with some sugar, to add to the flavor. While Pete and Joey are cooking, Queenie returns with an apron for Joey with bodybuilder abs on the front that makes him laugh. "I look like this under the shirt," says Joey. "That's what I've been told," says Queenie. They're making a massive quantity of sauce - five to six gallons. Some of it will go on the five lasagnas they're making, but the rest will be frozen in bags for everyone to take home and enjoy throughout the year. After a mountain of onions and garlic have been chopped, Pete and Joey head outside so they don't make too much mess in the kitchen. While the onions are cooking, it's time for the beef - 8 to 10 pounds of ground beef and 5 to 6 pounds of Italian sausage! After that, there's more veggies, three industrial sized cans of tomato sauce and tomato paste, and quite a bit of wine too! Because wine plays such a big part in this family's gatherings, it's only fitting that one of the crew - Gretchen - is a sommelier, a certified wine expert. She gives Joey a basic lesson in wine. Gretchen brings a few benchmark wines for Joey to taste along with some foods that help bring out that wine's flavor profile. She pours wine into a glass and shows how it should be swirled around first and then smelled. The swirling is because the wine has been sitting in the bottle, possibly for a long time, and the movement helps wake up the wine's aromatics. So, if you're not really into wine, but want to start drinking it, what does Gretchen recommend? She suggests Zinfindels, which can be a little more plush and fruity. Next, Joey goes back to making lasagna by mixing together the ricotta and spinach filling before putting it together with Pete's homemade noodles. The Wainwright family layers the lasagna ingredients together in a big assembly line, enjoying being together as the cook. Of course, with all the wine being consumed, some members might not make it to the assembly line. "If you're sober enough, you get to be in the line, and it's just layer of the sauce, the noodles, the cheese," says Pete. Then it's time for Joey to make some molasses cookies with the Wainwright kids. "My great great grandmother Tillie Strunk always made molasses cookies. They're not gingerbread," says Queenie. "It's really different, and they're really good." "Champagne: in defeat, one needs it. In victory, one deserves it!" Finally, it's time to taste the lasagna they've been working on all day. "That is good, good, good!" says Joey. "That papa sauce is papa-tastic!" This delicious pasta sauce has a hidden healthy component - tons of veggies pureed with chicken stock. Use it in lasagna or over any type of pasta for a delicious and nutritious meal. This classic lasagna recipe is great to make on your own, or have a party like the Wainwright family does. These cut out cookies are a fun twist on a traditional holiday treat. The Wainwright family loves wine, so it only makes sense that one of them is a sommelier. Gretchen gives Joey a basic lesson in wine and wine-tasting, including tips for those who are new to drinking wine. 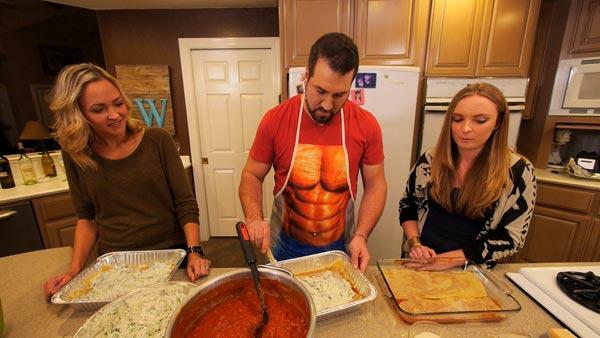 Go behind the scenes as Joey Fatone joins the Wainwright family as they make lasagna together.